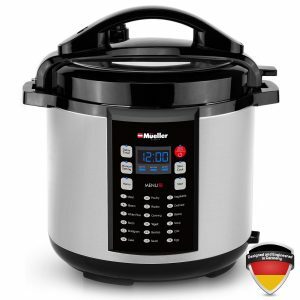 Mueller Pro Series is a 6 quartz capacity 10-in-1 pressure cooker with the German ThermaV Even Heating technology, 18 program options and a variety of other features. It will let you cook meals at a simple touch of a button and even two meals at the same time with the bonus stainless steel rack included in the box. It also comes with a tempered glass lid as a bonus, as well as a plastic spoon and a measuring cup. Your meal will be ready much quicker than normal stovetop with the three pressure levels to choose from. In terms of security, it is nothing like those pressure cookers of the old days and comes with 9 security features as both a UL and ULC certified product. You will get easy to follow and understand healthy recipes so you can make wholesome and healthy meals very quickly (recipe book and user manual included). By cooking two meals at once using the stainless steel rack you will be saving both money and time. The 18 smart options include meat, steam, white rice, broth, multigrain, cake, poultry, risotto, canning, curry, sterilize, sauté, vegetable, oatmeal, beans, soup, chili, and egg. You can steam rice, sauté, slow cook, sterilize, make yogurt and more. It is quite a few popular product and there are a few customer reviews online and scores 4.5/5 stars out of 224 ratings as of today. Mueller 10-in-1 Pro is a very good quality German engineered product that proves to be very sturdy and durable, with the best internal components and electronics, solid and reliable heat-resistant handles and decent rubber seals. The interior coating- heat vessel surface is coated with non-stick ceramic and the unit is free of PTFE and PFOA and has a three-ply bottom so the heat is distributed evenly in a properly sealed container so all the aromas and flavors, minerals, vitamins and healthy enzymes stay in. There is no chemical coating and the cooking pot is food grade 304 ss- stainless steel. You’ll only find the latest technology components including the microprocessors that watch the temperature, pressure, with the duration and heating intensity adjusted so you get the optimal results consistently. It replaces ten different cooking appliances and multiple pans in the kitchen and cooks by using up to 70% less energy and in 2 to 6 times shorter time. There is the Auto Keep-Warm option that will keep your meal warm until you’re ready to serve and eat. You can choose to delay your cooking for up to 24 hours with the delayed cooking option. It cooks quickly with high pressure yet very quietly, making no noise and doesn’t give out any steam. The minimum cooking time is five minutes on this unit and by pressing the manual button on the display panel you will increase it by a minute. If there is a power cut it will remember where it left off and continue cooking and will go into Keep Warm mode after the cooking is completed. You can make great stews, curries, soups, rice, chili, cake and a variety of other meals, boil eggs and make yogurt without changing pots or pans. You can simply change the function through the touch button display. Both the interior and exterior of this cooker are easy to clean. 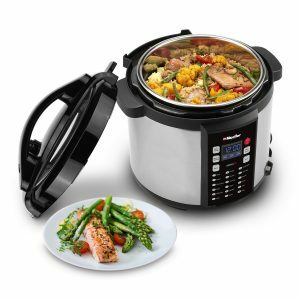 It is a very well built and sturdy cooker which has more functions than Instant Pot Pressure Cooker, is very efficient and versatile, does the job very well and the food tastes so much better than stovetop. It is offered with a year of warranty according to the Mueller Austria website.